It won the National Film Award for Best Feature Film in Hindi, the National Board of Review Award for Top Foreign Film, the Golden Camera and Audience Awards at the Cannes Film Festival, and three awards at the Montréal World Film Festival. The film was India's second film submission to be nominated for the Academy Award for Best Foreign Language Film. The film was among the list of "The Best 1,000 Movies Ever Made" by The New York Times. Before the start of the film, Krishna has set fire to his bullying elder brother's motor-bike. This has landed him in big trouble with his mother. She has taken him to the nearby Apollo Circus and told him that he can only come home when he earns 500 rupees to pay for the damaged bike. Krishna agrees and works for the circus. The film begins as the circus is packing up to move on. His boss asks him to run an errand, but when Krishna returns, he finds that the circus has left. Alone, with nowhere to turn, and without the money to repay his mother, he travels to the nearest big city, Bombay. As soon as he arrives, he is robbed of his few possessions. He follows the thieves, befriends them, and ends up in the city's notorious red-light area of Falkland Road, near the Grant Road Railway Station. One of the thieves, Chillum, a drug pusher and addict, helps Krishna to get a job at the Grant Road Tea Stall, and becomes a mentor of sorts to Krishna. Baba, a local drug dealer, employs people like Chillum who are addicted to his drugs. His wife, Rekha, is also a prostitute and they have a little daughter, Manju. Rekha is annoyed that she has to raise her daughter in such an environment. Baba earlier promised to start a new life elsewhere, but it is a promise which Baba cannot fulfill, or has no intention of fulfilling. Krishna gets a new name, "Chaipau", and learns to live with it. His goal is still to get the money he needs to return home to his mother, but he soon finds out that saving money in his new surroundings is next to impossible. To make matters worse, he has a crush on a young girl named Sola Saal, who has been recently sold to the brothel. He sets fire to her room and attempts to escape with her, but the two are caught. The fire causes Krishna to get a severe beating, while Sola Saal, who is considered valuable property since she is still a virgin, denies starting the fire and tearfully tries to resist her enslavement. The madame of the house asks Baba to "tame her," which Baba agrees to do. Meanwhile, Krishna works odd jobs to feed himself and look after Chillum, who can't live without drugs, especially after Chillum is thrown out of Baba's employ after a disastrous interview with a foreign journalist. Eventually, one of these odd jobs costs Krishna his job at the tea stall. To get more money, Krishna and his pals rob an elderly Parsi man by breaking into his house in broad daylight. Krishna eventually finds out that the money he had saved had been stolen by Chillum who had used it to buy drugs, which he had overdosed on and died. One night while returning home from work with their friends, Krishna and Manju are apprehended by the police and taken to a juvenile home. Eventually, Krishna escapes and goes back to his world. He finds a new recruit in Baba's drug business has taken Chillum's place and name. Krishna meets Sola Saal and tries to convince her to run away with him. She reveals that she is charmed by Baba and no longer interested in Krishna; she is driven away to service her first 'client'. Meanwhile, Rekha is told that the authorities will not release their daughter, because the mother is a prostitute. An angry Rekha decides to leave Baba, but Baba beats her in retaliation. She is saved by the timely intervention of Krishna who, in a fit of rage, kills Baba and attempts to run away with Rekha, but they become separated in a parade honoring Ganesh. The film ends with a slow zoom in to Krishna's dejected face, alone and being thrown back to the same reality he started out with in the film. 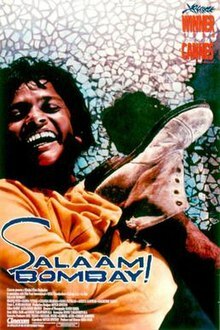 Most of the young actors who appeared in Salaam Bombay! were actual street children. They received dramatic training at a special workshop in Bombay before they appeared in the film. In 1989, director Mira Nair established an organization called the Salaam Baalak Trust, to rehabilitate the children who appeared in the film. Most of them were eventually helped. The Trust is still in existence, and now lends support to street children in Bombay, Delhi and Bhubaneshwar. Shafiq Syed, who played the role of Krishna in the movie now earns his living as an autorickshaw driver in Bangalore. Salaam Bombay! earned $2,080,046 in the United States and Canada. In France, the film sold 633,899 tickets. At the average 1991 ticket price of 34 F ($6), this was equivalent to 21,552,566 F ($3,803,394). In Germany, the film sold 258,728 tickets. At the average 1990 ticket price of 9.5 DM, this was 2,457,916 DM. At the average 1988 exchange rate of 1.585 Deutsche Marks per US dollar, this was equivalent to $1,550,736. In total, the film grossed $7,434,176 in overseas markets. At the average 1988 exchange rate of 13.9171 Indian rupees per US dollar, this was ₹103,462,171 (equivalent to ₹880 million or US$12 million in 2018). ^ "The Best 1,000 Movies Ever Made". The New York Times. New York Times. Retrieved 21 September 2011. ^ More information on the Salaam Baalak Trust Archived 2 March 2006 at the Wayback Machine at GiveWorld. ^ "Salaam Bombay! (1988) - Box Office Mojo". ^ "Salaam Bombay (Europe)". JP's Box-Office. Retrieved 22 March 2018. ^ Naughton, Leonie (2002). That was the Wild East: Film Culture, Unification, and the "new" Germany. University of Michigan Press. p. 68. ISBN 978-0472088881. ^ "Historical US Dollars to German Marks currency conversion". University of California, Santa Barbara. Retrieved 22 March 2018.